Make sure you check out the latest episode of the JustUs Geeks Podcast! 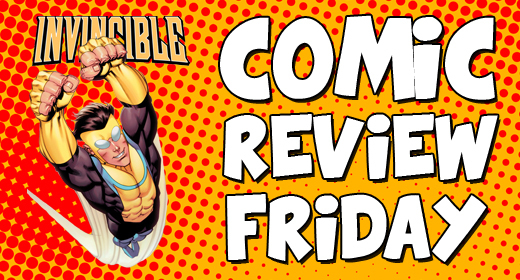 It is not often that a comic book delivers exactly what is shown on its cover, but Invincible #106 does just that. Kirkman continues the calm that has developed after the conclusion of the Dinosaurus, but finally gives us some real meat to sink our teeth into with this issue. Focusing on the often dysfunctional and always super antics of the Grayson family was a smart move considering the tense nature of recent issues. Even with the peaceful nature of the issue, Kirkman started laying the groundwork for conflicts to come, which really provided a perfect bookend for an above average issue. Honestly, I have been worried that Kirkman’s work on All Out War was going to negatively affect his writing on Invincible, and to a certain degree it has. This was not your normal Kirkman issue. This issue really came across as Kirkman taking a break due to the amount of time he was spending on The Walking Dead. The narrative was not complex, but it did not need to be. The timing of this issue really just shows how good Kirkman is at planning his books. I just hope that he can find time over the next six months to give Invincible the treatment it deserves. The absolute best part of this issue was the interactions between the members of Mark’s family. It was especially telling that Eve still does not trust Nolan because of his actions way back in issues #9-13. Despite Debbie and Mark insuring her that he is reformed, she still cannot bring herself to fully trust him. Another incident of note is when Nolan and Mark have a battle of egos that leads to an arm wrestling contest between the two. I cannot get over how well Kirkman has crafted the relationships in this family. It allows for some of the most dynamic narrative that I have ever seen in a comic, and this issue exemplifies it perfectly. Ottley’s art is pretty spot on this issue. Of note is the opening sequence involving Battle Beast. Since his first appearance I have always found Battle Beast to be one of Ottley’s best drawn characters, and in this issue we get to see Ottley have all kinds of fun with him. He also captures the arm wrestling between Mark and Nolan perfectly. Ottley continues to prove that he is one of the best artist in the industry this issue, despite a few awkward panels. Overall the action is easy to follow and it looks good. You cannot ask much more from artist. This is definitely the issue that us Invincible fans have been waiting for. Kirkman is finally giving us some direction, and providing entertaining content while he does so. Despite worries of Kirkman’s time commitment to The Walking Dead, I have faith that Invincible will continue to ramp up as we approach its ten year anniversary. This book exemplifies why Kirkman is the best comic creature in the business right now, and because of that I give it a five out of five stars. Steven Lacoste liked this on Facebook. You are absolutely right, which just goes to show you how underplayed Invincible’s 10th Anniversary was compared to The Walking Dead’s. I apologize for the mistake.